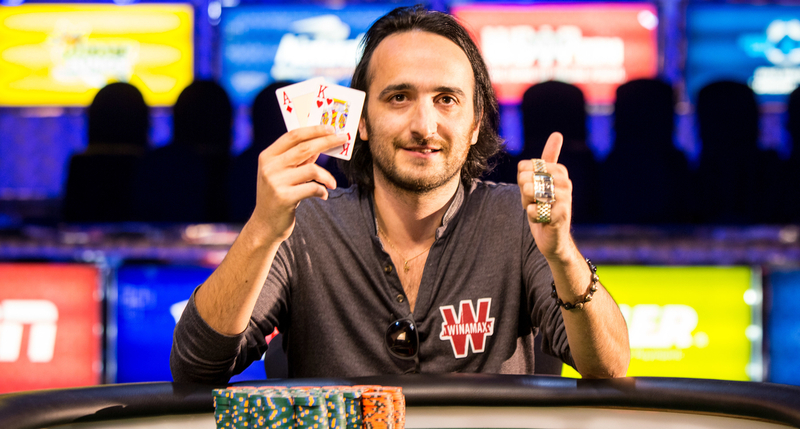 The World Series of Poker $3,000 six-handed no-limit hold’em event needed an extra day to wrap things up, but in the end, Belgium’s Davidi Kitai picked up his third career gold bracelet and became the first non-American player to win a title at this year’s summer series. Kitai, who is one of only five players in poker history to win the Triple Crown consisting of a WSOP, EPT and WPT title, earned $508,640 for topping a final table that included Gordon Vayo (2nd) and Tony Ruberto (3rd). Kitai earned his first gold bracelet in 2008, winning a $2,000 pot-limit hold’em event for $244,583. His second came in 2013, topping the $5,000 pot-limit hold’em event for $224,560. He now has nearly $4.7 million in career tournament earnings. The Belgian pro also picked up 1,368 Card Player Player of the Year points for his finish, giving him a total of 2,588, which is good enough for fifth place overall. This was his fourth final table of the year. Kitai’s victory overshadowed another deep run by Phil Hellmuth, who was gunning for his 50th career WSOP final table. Hellmuth busted in eighth place, earning $45,022. Before being eliminated, he took some time to berate Kitai, according to the WSOP live updates, saying, “Crazy Frenchman is going to cost me my 14th bracelet. You have no chance to win, sir.” He later added, “Of course he’s never won a tournament before,” apparently oblivious to Kitai’s lengthy list of accomplishments.